In 1995, intelligence reports begin to leak out that there a weapon of mass destruction has been constructed within Outer Heaven, a mercenary fortress in South Africa. The US government gets Big Boss to send FOXHOUND operative Gray Fox to infiltrate their fortress and determine if their intelligence was correct. Gray Fox does locate the weapon, but is captured by Outer Heaven forces, his last transmission being an ominous utterance of "Metal Gear..."
Shortly after, FOXHOUND member Solid Snake is sent into Outer Heaven for his first mission by Big Boss. He is instructed to locate and rescue Gray Fox and then find what he can about Metal Gear. 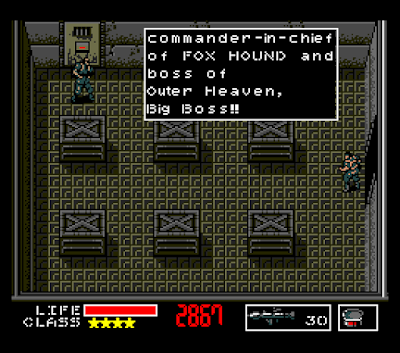 After freeing many prisoners of war, including the local resistance leader Kyle Schneider, Snake is pointed to Gray Fox's location. He is intentionally captured and then breaks into Fox's cell, where he is told of Metal Gear's capabilities: it is a walking, nuclear-equipped tank, but luckily is still inactive. Fox instructs Snake to locate Metal Gear's captive creator, Dr. Pettrovich Madnar, in order to discover how to destroy it. After fighting his way through Outer Heaven, including taking down some of the group's lieutenants, a Hind D, a battle tank, a bulldozer and an imposter Dr. Madnar, Snake makes his way to the real Dr. Madnar's cell with the help of the resistance member, Jennifer. However, Dr. Madnar refuses to help Snake until his daughter, Ellen, is saved. A resistance member, Diane, advises Snake on where to find Ellen, and he dutifully hurries to rescue her. After fighting through more of Outer Heaven's soldiers, Ellen is rescued and Snake returns to Dr. Madnar. He tells Snake that Metal Gear is in the 100th basement floor 20km north and would need to place plastic explosives on its feet in a specific order to destroy it. Determined to complete his mission, Snake hurries to Metal Gear's hangar, but is constantly ambushed by enemy troops and nearly led into a series of traps due to poor intelligence from Big Boss. Eventually, Big Boss orders him to abort the mission entirely. Disregarding Big Boss's orders, Snake enters Metal Gear TX-55's hangar and places the explosives on its feet as per Dr. Madnar's orders. Metal Gear is destroyed and a self-destruct sequence is initiated. Snake hurries to escape, but is confronted by Big Boss! Big Boss tells him that Snake had been sent in to acquire false information, but he had gone too far. The pair fight, but Snake defeats his mentor and escapes Outer Heaven just as the facility is destroyed. It should probably go without saying that Metal Gear's gameplay is incredibly simple, but I was actually really surprised by how many of the series' distinctive elements were still intact here. 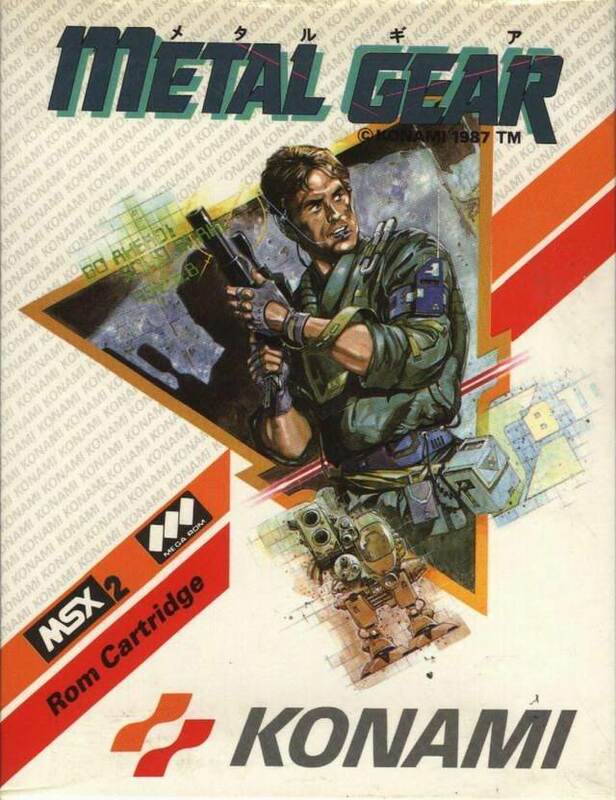 For example, Metal Gear has remote control missiles, cigarettes, rations, card keys, a Hind D, post-credit twist and even the cardboard box - elements which would be intact through most (or, in some cases, all) subsequent releases in the franchise. As a result, this lends the game a sense of familiarity for someone like me who got into the series with Metal Gear Solid, and makes it quite interesting to see how the game's systems were iterated upon over time. Naturally, the stealth gameplay is incredibly simple - enemies and cameras can basically only see things that are right in front of them and you're going to be punching most enemies to death to sneak around. A methodical approach is very much necessary though, especially in the early moments in the game as you are still learning how to remain undetected. I was trying to rush at times (especially when I died and redid a section), but when I did so I was making all sorts of little, critical errors which would get me killed all over again. As a result, the game has a very clear skill gap which rewards replays, similar to many 8-bit classics of the era. Rewarding replays also ties into the map layouts. The game gives you very little direction and lacks a map system, so you're probably going to end up wandering around a lot if you don't have a guide. It's also worth noting that most items and enemies refresh when you exit a room, so you can farm for necessary items by entering and exiting rooms. This is, in fact, a crucial key to success, and a factor which I was ignoring in my noob-ness in the first hour with the game. Once I figured this out though, the game became significantly easier and I enjoyed it much more. Guide-less exploration also helps to memorize map layouts and these critical item locations. While the game contains quite a bit of "Metroidvania"-style backtracking, it becomes rather satisfying to be able to navigate throughout the buildings to get to a specific destination without having to refer to a guide or map to get you through. There are quite a few parts of the game though where you need to punch specific walls to figure out where to place plastic explosives in order to advance, and if you are unaware of this then I imagine that these sections can be quite frustrating. There is definitely a vein of old-school charm to be had in Metal Gear, but it also has a punishing skill gap which is going to be a major turn-off for many who might not even get past the first 15 minutes. I myself was tempted to throw in the towel a few times. The game can be very difficult, especially in the first part of the game where every death can cost you 10-15 minutes of playtime. This is primarily due to the game's poor checkpoint system, which only triggers when you reach an elevator or achieve some sort of major progress (eg, getting captured in order to rescue Gray Fox). From what I understand, the frequency of the checkpoint system is also tied to your "Class", a system which also increases your inventory size and health bar based on how many POWs you rescue during the game. This system further makes the early parts of the game significantly harder than the latter sections, but can also make completion of the game impossible - if you don't have 4 stars and there are no POWs left, then it becomes impossible to destroy Metal Gear, prompting a full-restart. To make this worse, one of the last bosses that you might before Metal Gear uses POWs as human shields, and if you shoot a POW, your class will decrease. Detection is also very punishing, if only due to the inadequate shooting controls on the MSX2. Snake can only shoot up, down, left and right, meaning that there are huge chunks of the screen which he can't hit. Considering that enemies can shoot diagonally and move very fast and very erratically, chances are that you're probably going to take quite a bit of damage on every detection. This is mitigated somewhat by having most alerts refresh as soon as you move on to the next screen, but this isn't really a foolproof solution - for one thing, it makes the enemies seem extremely stupid, but it also is really inconsistently implemented. Sometimes detection results in enemies pursuing you constantly, with total annihilation of them being required to end the alert. However, you won't know if this is the case until you have left the screen and the alert is still in effect, as there seems to be no audio or visual cue to show what state of alert is in effect. Arguably the worst aspect of the game though is the reliance on key cards. This is a major source of frustration and is the main reason why the backtracking is so prevalent in the game (not to mention that it pads out the runtime significantly). The game has 8 unique key cards, so if you don't know which card works for each door then you're going to have to cycle through your entire inventory to see if a card will work on the door you're trying to get into (and you may not even have the required card in your inventory, which is even more of a kick in the balls). Considering that you may be under fire when this is happening or in a room filled with poison gas (and not wearing your mask because you can only have 1 item equipped at a time), you can very easily die because of this inexcusable, frustrating piece of archaic game design. The game's graphics are also pretty bad. This is actually more than a petty complaint (although the graphical style is strikingly reminiscent of the notoriously bad Bible Adventures game), because the graphical design does a poor job of letting you know when you're in danger. For example, the security cameras can be annoyingly inconsistent - normally you have to hide behind cover to avoid them, but I had a few instances where I was certain that I was in cover but would get spotted anyway. The land mines are also major offenders here, as I was constantly stepping on land mines... with my upper torso. I had a quite a few inexplicably cheap deaths from the game's ambiguity about whether you're safe or not. The absolute worst offender in the game though is the infamous "trap rooms" in the late stage of the game - these floor traps are one-hit kills and if even 1 pixel of your character model brushes against them, you die. There's basically no warning when or where these traps show up, so getting through them is just a matter of frustrating trial, error and route memorization as you try to remember the few places where you won't get killed if a single pixel touches the edge of the pits. Guards in this game are incredibly stupid. In addition to completely forgetting you if you leave their screen most of the time, when they are alerted they will run around randomly and bump into objects as they try to home in on you, meaning you can hide behind a corner and punch them to death easily when they finally manage to get to you. When they are unaware though, they follow a standard, set patrol pattern which will feel instantly familiar to Metal Gear franchise vets and makes for some fun gameplay. The game also features jetpack enemies, which can be panic-inducing the first few times you encounter them. They're very fast and hard to actually hit, making combat with them inadvisable. Luckily, they only show up at parts where you should run like hell away from them, but if you aren't following a guide then I imagine they could be a major headache. 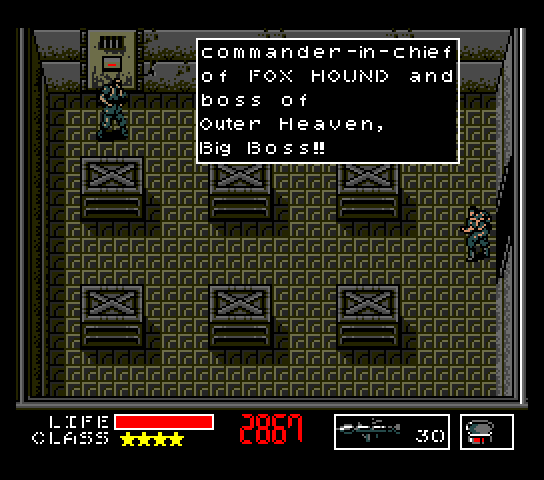 The game also has quite a few distinct bosses which, while very simple and easy, are quite fun and often feature the signature Metal Gear gameplay-twists that make these battles so exciting... plus in the original release they have some pretty hilarious Engrish names like Shoot Gunner and Coward Duck. I think my favourites were the fights against a tank and the fight with Shotmaker (aka Shoot Gunner), in which you start the battle with no weapons. 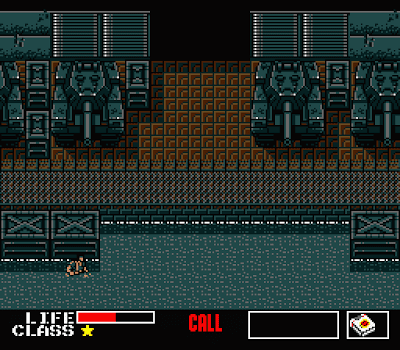 Also of note is that the MSX version of the game has a showdown with a non-active Metal Gear. This fight is a bit disappointing and artificially challenging - you have to put plastic explosives on its legs in a specific order to do any damage for some inexplicable reason. Meanwhile, laser cameras shoot at you, with each shot taking off half of your health bar! It's not particularly challenging, especially if you've farmed for rations prior to the fight, but it is certainly noteworthy as the first battle with Metal Gear in the entire series. This is then capped off with a fight against "Big Boss" himself, although it is quite easy as he doesn't seem to know enough to not run into your rocket launcher's shots. It should probably go without saying, but Metal Gear's story is significantly more simple than any other game in the franchise, and is only marginally better than your average 8-bit game. Most of the plot points are just meant to pad out the game's length (eg, all the hunting for Dr. Madnar and then having to rescue his daughter before he'll actually help you). As a result, it is probably the most heavily-retconned game in the entire franchise, with even its direct sequel, Metal Gear 2: Solid Snake, making some pretty substantial changes to the game's story. Unfortunately, this can lead to some retroactive disappointment, such as Solid Snake's lack of characterization and Outer Heaven getting dispatched so easily after being hyped up so much in the prequel games (not to mention the multiple issues that The Phantom Pain's ending throws into the mix). At best, I guess you can argue that the simple nature of the plot means that there's a lot of room for background plots to be unfolding which are implied by the other games but never really explicitly shown in Metal Gear itself. 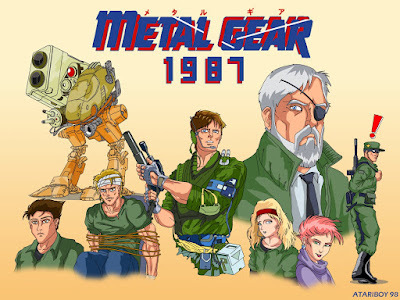 Put simply, Metal Gear was obviously never intended to become the first chapter in an epic saga. It was clearly just meant to be a fun, 80s-style action story, including the requisite "traitorous commander" twist. Considering that the game's art (and the art of its sequel) use images of action movie stars as the basis of Solid Snake and Big Boss, it seems fair to suggest that this was the intent. The concept of Metal Gear itself though is quite an interesting one for such an otherwise simple game and one which definitely deserved expanding upon for its own merits. Metal Gear TX-55 has a really cool, unique, old-school design which I wish that Peace Walker and The Phantom Pain would have tried to emulate. As I've hopefully made clear, Metal Gear is a very simple, if at times frustrating, game with a lot of old-school charm and a great (if sparse) 8-bit soundtrack. Not not sure that everyone will have what it takes to get through it, but completing it with a guide should only take around 3-4 hours. In fact, now that I have gotten through the game and have acquired the necessary skills to succeed, I'm kind of itching to play it again - this time, without a guide. Considering that I still have to play through the rest of the series to get this retrospective done, it probably won't happen, but if that isn't a testament to how fun this game is almost 30 years later, then I don't know what else will sway you. *As a child, Kojima was apparently forced to watch 1 movie every night before bedtime.